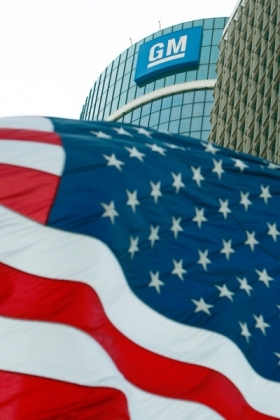 General Motors Corp.'s bankruptcy estate is seeking approval of a settlement that would set aside $773 million to resolve environmental claims by the federal government and 14 states. A mixture of cash and assets, placed in trusts, would clean up and administer 89 properties, 59 of which are known to be contaminated, Gary Grindler, acting deputy attorney general, said in a statement. A 30-day period to gather public comment will precede a request for bankruptcy court approval. More than half the money would go for sites in New York and Michigan, Grindler said. The St. Regis Mohawk Tribe, the U.S. Environmental Protection Agency and the states are part of the settlement. The tribe has yet to accept the proposal. A public hearing is scheduled for Wednesday evening. The accord paves the way for the automakers' unwanted business to wind down in bankruptcy on the eve of a hearing Thursday at which the Old GM estate will seek court approval of terms of its liquidation. When GM filed for bankruptcy in June 2009, it sold attractive assets to a newly formed company and left the 89 properties at issue in today's settlement under bankruptcy protection. The U.S. Treasury and Canada's export credit agency had lent the bankrupt estate $1.175 billion to wind down the bankrupt properties. The EPA later filed claims in the case for environmental cleanup costs, as did the states. Money for the settlement will come from past government loans to the automaker, said Tim Yost, a spokesman for the estate. In May, U.S. Bankruptcy Judge Robert Gerber in New York gave the company a four-month extension in Chapter 11 to resolve environmental and asbestos liabilities. Two units of the automaker formed to hold environmental liabilities owed about $1.2 billion in cleanup costs, according to court papers. The amount set aside by Old GM is the largest of recent environmental settlements. Chrysler Corp.'s old estate in bankruptcy set aside $15 million for cleanup costs at polluted properties. Lyondell Chemical Co. resolved an estimated $5.5 billion in environmental liabilities with about $170 million, according to court papers. Old GM's settlement includes $641 million in cash and non- cash assets worth $120 million. It has paid $11.5 million to clean properties during its bankruptcy. The so-called Massena site in New York's Saint Lawrence County will receive $120.8 million. The U.S. alleged that GM's aluminum die-casting plant, operating there from 1959 to 2009, polluted the property with polychlorinated biphenyls, or PCBs. The St. Regis Mohawk Tribe has lands affected by contamination from the Massena property. The settlement doesn't affect U.S. claims against Old GM for past costs related to natural-resources damages at the properties being placed in the trust, according to Grindler's statement.